Some of my friends know that I'm working on a posting that will cover early (1959-61) stereo singles and some other weird seven-inch records found in the shelves at Chez Zorch. Don't fret, guys...it's coming. But here's a little something to clear the palate (or something). Saturday night, we had another listening session at Ed Reynolds's. Again, he pulled out some amazing records for our enjoyment. I'm holding a rather scarce item, an Edison Bell Radio record that Ed played for us...it's a British import, eight inches in diameter. Oddly enough, somebody else has posted a YouTube video of his machine playing a copy of the same record: http://www.youtube.com/watch?v=ezkzCJ4pgvc&feature=related . Nice clarinet solo, eh, wot? I felt like Howard Carter opening King Tut's tomb...everywhere was the glint of pastry! Actually, this trove contained delicious Danishes and the like. Another box contained the doughnuts. Here's a special cut for our Pal From Pennsylvania! Chicago, 3 July 1935: Washboard Sam, vocal & washboard; Black Bob, piano; Big Bill Broonzy, guitar. Interesting name for a musician...Ham Gravy! It's obviously a pseudonym for Washboard Sam (born Robert Brown), who was under contract to Victor's Bluebird label at the time. Charlotte, NC, 18 June 1936: Jimmie Gunn, piano and director; "Slats" (unknown last name), trombone; Skeets Tolbert, alto sax; Otis Hicks, tenor sax; unknown, guitar; Harry Pratner, bass; and others. The title has nothing to do with surgery or telephones...it's a reference to the jukebox, which was coin-operated. An "operator's special" was a side that was assured to get a lot of play. Sometimes they were called "nickel nabbers." NYC, 3 January 1939: Jimmie Lunceford, conductor; Eddie Tompkins, Paul Webster, Sy Oliver, trumpets; Elmer Crumbley, Russell Bowles, James "Trummy" Young, trombones; Willie Smith, Earl Carruthers, Ted Buckner, Dan Grissom, Joe Thomas, reeds; Edwin Wilcox, piano; Al Harris, guitar; Moses Allen, bass; Jimmy Crawford, drums. Sy Oliver, arranger. This side, by the way, comes from Lunceford's first Vocalion session...he had recorded for Decca since 1934. He returned to Decca in March 1941. I noticed today that my free Box.net account was full. Sadly, I've had to remove some of the older files...but I've indicated the number of downloads per deleted file (for the record, of course!). 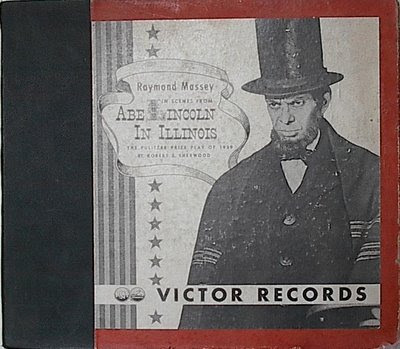 For this week's bicentennial of Lincoln's birth, I decided to post this somewhat scarce set of three twelve-inch 78s...the Victor album (M-591) of Scenes From Abe Lincoln in Illinois. The play ran for 472 performances from 1938-9 (http://www.ibdb.com/production.php?id=12391), and featured Raymond Massey in the title role. Abe also won the 1939 Pulitzer Prize for Drama for Robert E. Sherwood. Massey was in the 1940 film version of the play, and was also in several radio and television versions as well. One thing about this album that does perplex me a bit...the cover illustration is approximately the size of a ten-inch record, hastily pasted onto a twelve-inch album. Perhaps this album was originally planned to be a ten-incher...and was expanded to the larger format only after the cover slicks were made? Or maybe the printing orders were misread? Then again, in 1939, most twelve-inch albums had very plain covers...Victor's classical sets had front covers that consisted of colored heavy cardboard, often with a wavy texture (with a large flat lozenge that contained the album's title printed in gold). Columbia's sets were similarly plain-Jane at the time...the fancier illustrated covers of Victor and Columbia (by Decker, Steinweiss and friends) came into general use a year or two later. I italicized most because an earlier non-clssical Victor twelve-inch album had a special printed cover, and it took the entire 12-inch space (not just a ten-inch slick pasted in)...I'm thinking of their A Symposium of Swing album, which featured (among others) the original issues of Benny Goodman's Sing, Sing, Sing (aka A Jail And A Half, according to some wag) and the famous I Can't Get Started by Bunny Berigan. (I can't call the Victor version of Started original...Bunny recorded it once before under his own name for Vocalion. And he's on a version on Decca too, but that's really a Red McKenzie record. Someday I'll get around to posting those rather obscure versions too. ).